- Shift_JIS, a standard encoding used by many games (default). - Raw mode, which will read hex data copied directly from a hex editor. - Custom, where you can create a tbl file and assign characters to each tile. 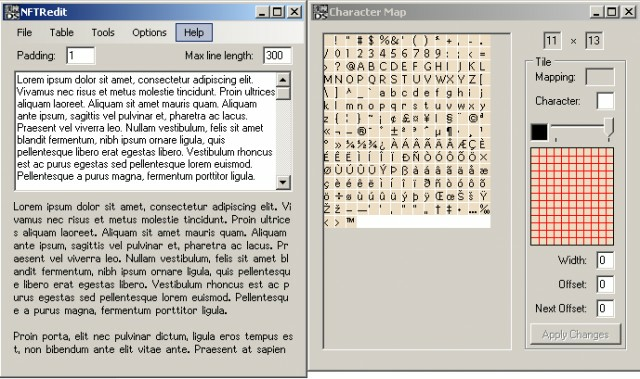 characters to tiles one by one from the Character Map. (or pasting data from a hex editor) to preview the text in the game's font. have the option of either saving it to a bitmap or copying it to clipboard. SAME COLOR PALETTE) and import the tiles back into the program. - Character: The character assigned to the tile in your custom tbl file. - Tile: The tile image itself. - Width: The width of the character in pixels. - Offset: The number of pixels of empty space to add before the font. custom table, if you assigned characters) when you're done. Changelog since previous version on filetrip.